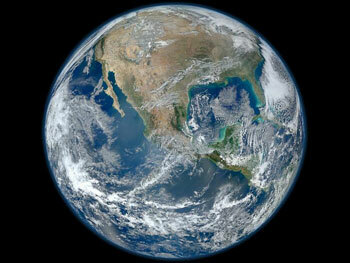 A Blue Marble image of the earth. On Earth Day, April 22, 2013, the San Mateo County Reusable Bag Ordinance will launch, requiring that County retailers no longer provide customers with plastic carry-out bags. On that day, San Mateo County joins other cities and counties that encourage the use of reusable bags, promoting healthier environments for citizens through the decreased use of single-use plastic bags. Researchers have well-documented the harmful impact to our environment and wildlife caused by single-use plastic bags. Plastic never biodegrades; instead it breaks down into smaller particles that seep into our soil and water. This “bag ban” is the result of sobering news that in California, 20 billion single-use plastic grocery bags are used every year, which end up in landfills, or as litter on land and in water. The ban will apply to all County retail outlets, including grocery stores, convenience stores, pharmacies and other shops. It does not apply to plastic bags used for restaurant food take-outs or for produce, meats, bulk foods and prescription medicines. Shop owners are encouraged return any unused plastic bags to their vendors for repurposing and/or refund. Robyn Thaw is with the San Mateo County Health System.